If you're running your Corvette in track races where wind splitters aren't permitted, or just want improved handling and style on the road, a high quality Corvette carbon fiber splitter is perfect for you. 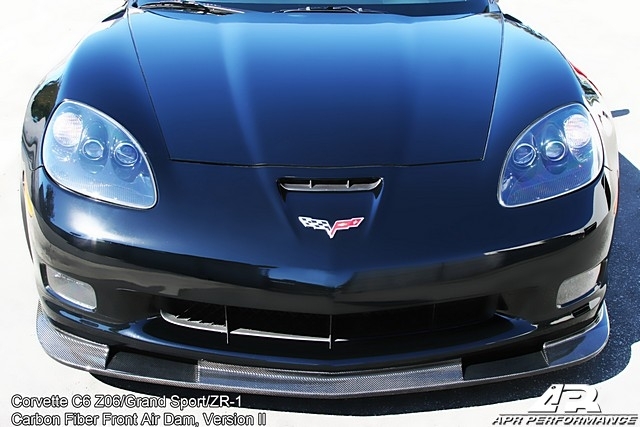 Manufactured from the highest quality carbon fiber component materials by APR Performance, the APR Version II Front Splitter for the C6 Corvette Z06 is beautiful, lightweight, strong, functional, and aggressive. The Corvette C6 Z06 APR Version II Splitter style follows the look and style of the very popular APR Carbon Fiber Front Splitter which utilizes a 2" extension at the center, but extends further (up to 3") towards the sides. This increased extension provides improved front end grip for improved stability at high speeds and a more aggressive visual style that helps set a Version II Splitter equipped C6 Z06 Corvette apart from the pack even further. Integral to the APR Front Splitter is a lower undertray design that allows for smoother underbody air flow. Cut out sections of the lower undertray design also retain the functionality of the factory brake system's cooling ducts. Corvette Bumper reinforcement supports are necessary for installation. We do not sell this front air dam without the necessary installation supports. Other companies might, so be sure to double check if their price is lower whether or not it includes all necessary installation equipment.